Specifications: shanks 1" x 27" on three shank model and 1" x 30" on the five shank model, Cat II 3-point hitch, structural steel frame tubing of 4" x 8" with 3/8" wall thickness, two (2) support stands. Overall frame width: RPL-300 73", RPL-500, 95". Shank spacing of 20 or 30 inches. Weights: 3-shank 1000 to 1025 lbs., and 5-shank 1395 to 1438 lbs. Options: rear utility hitch, 2 1/4" square toolbar, transport rack. 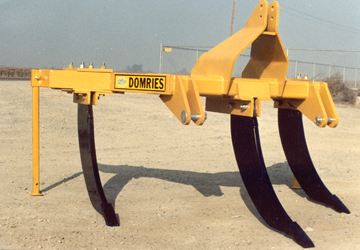 Features: shatters hard and compacted soils for better water penetration for crop roots to reach down deeper to stored moisture, staggered rank shanks require less tractor horsepower, replaceable shinbars and cast iron points prolongs shank life, shear-bolt protected shanks, support rails ensure shank brackets do not loosen or bend.